The FDXIR-3MPW infrared dome camera comes equipped two EXIR Smart LEDs for up to 170 feet of night vision. 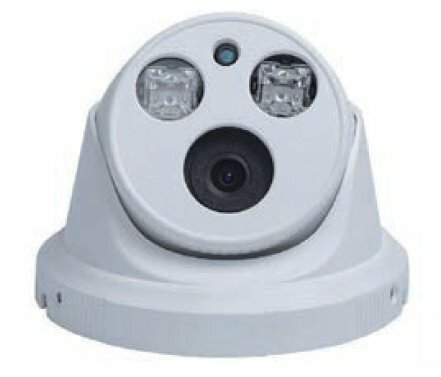 The day/night feature allows for full color images in daylight then auto switches to B&W at night or very low light and uses the extra bright matrix LEDS to maintain surveillance even in total darkness. The eyeball dome design allows easy installation on walls or ceilings and the small housing is appealing for both indoor or outdoor applications. The 3 Megapixel HD-TVI recording resolution provides extremely clear image quality and detail. The camera's video output can also be set to 1080p or standard analog making it compatible with most any DVR. Comes with a 3.6mm fixed lens for wide angle coverage and IP66 weatherproof housing. For 3 Megapixel recording and playback this camera will require the use of a 3MP HD security DVR.